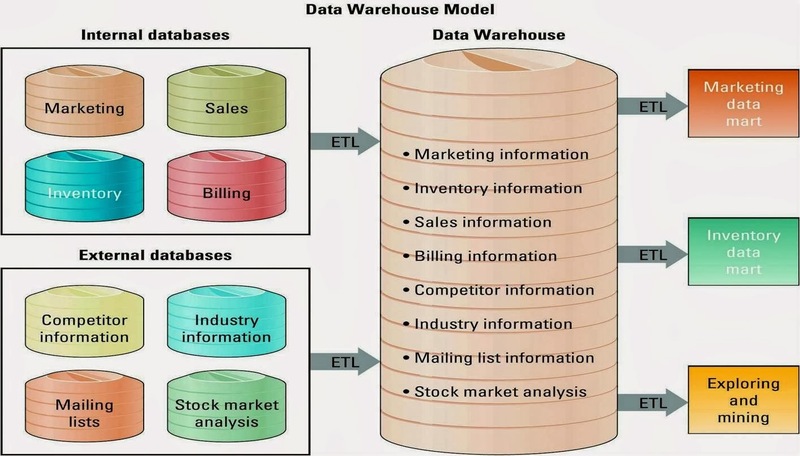 - A data warehouse is a logical collection of information-gathered from many different operational database-that supports business analysis activities and decision-making tasks. - The primary purpose of a data warehouse is to aggregate information throughout an organization into a single repository in such a way that employees can make decisions and undertake business analysis activities. - The data warehouse then send subsets of the information to data mart. *Figure above show compiles information from internal database or transactional database and external database through extraction, transformation and loading (ETL) which a process that extracts information from internal and external database, transforms the information using a common set of enterprise definitions, and loads the information into a data warehouse. - A cube is the common term for the representation of multidimensional information. - Data Mining Tools use a variety of techniques to find patterns and relationships in large volumes in information and infer rules from them that predict future behaviour and guide decision making. - Information cleansing or scrubbing is a process that weeds out and fixes or discards inconsistent, incorrect or incomplete information. - Business Intelligence refers to application and technologies that are use to gather, provide access to, and analyze data and information to support decision-making efforts.